Our products give contractors the ability to coat over boring or ugly concrete, transforming it into a stunning work of art. The possibilities are endless… View our Photo Gallery for just a few examples. For contractors, we offer Free Training Classes and a Training Video that covers installation instructions. Classes are scheduled monthly and held at our facility in the Phoenix area. Please call us at 888.440.3320 for details. 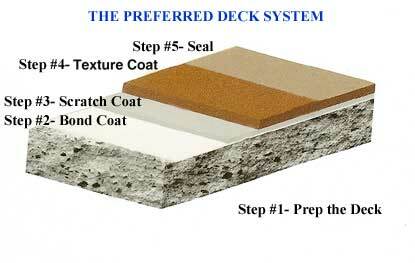 The Preferred Deck System is stain resistant, is easy to apply, and is practically maintenance free. Our products surpass other manufacturers’ products, because we use the best quality resins and raw materials available, while remaining competitively priced. Click here for a Specifications Sheet of the Preferred Deck System, which has a Two-Year Limited Warranty. At Preferred Deck, we have two simple objectives: to offer superior products at a reasonable price, and to provide excellent customer service to contractors, distributors, and the end-user. Click here for Warranty Information. The Preferred Deck System is stain-resistant and practically maintenance free. Click here for Maintenance Information.